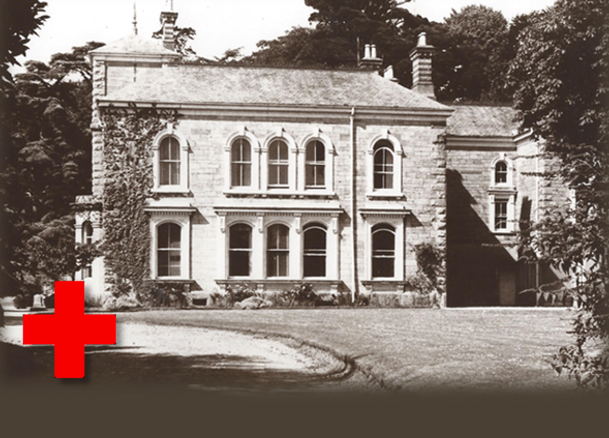 John Allen, who purchased Stowford Paper Mill in 1849, totally rebuilt Stowford Lodge. The property is predominantly limestone but features granite outlines. A sweeping staircase leads to a stained-glass window depicting Sir Francis Drake receiving a knighthood aboard The Golden Hind from Queen Elizabeth I, after his successful circumnavigation of the world. The house is located within a small estate set out with lawns and punctuated by mature specimen trees. The house, offering spectacular views over the Erme Valley and the moorland of Hanger Down, undoubtedly made for a pleasurable stay. As early as 1909, The Red Cross in Devon had started working on plans to create hospitals and convalescent homes to help relieve pressure on the military hospitals in the case of war. By August 1914, many V.A.D (Voluntary Aid Detachment) Hospitals were ready to take in patients. On 7 Nov 1917, a Red Cross Public Meeting was convened in Ivybridge to discuss the need of a hospital in the village. Mrs Mildmay from Yealmpton presided over the meeting whilst Mr W. B. Craig, Assistant County Director of Red Cross Hospitals and prominent member of the community of Ivybridge, promised financial assistance for the establishment of a hospital. From December 1917, Stowford Lodge, kindly lent by the owners of Stowford Paper Mill became a second line V.A.D. Hospital, providing 50 beds. The hospital was equipped and liberally supported by the residents of Ivybridge and the surrounding area. In many cases, women volunteered on a part time basis to help with clerical and kitchen duties, although the role of cook was a paid position. From the day it opened, the local parish magazine carried regular articles regarding the activities at the hospital. These provide a unique insight, describing the work of the dedicated staff along with the immense gratitude expressed by the injured servicemen. 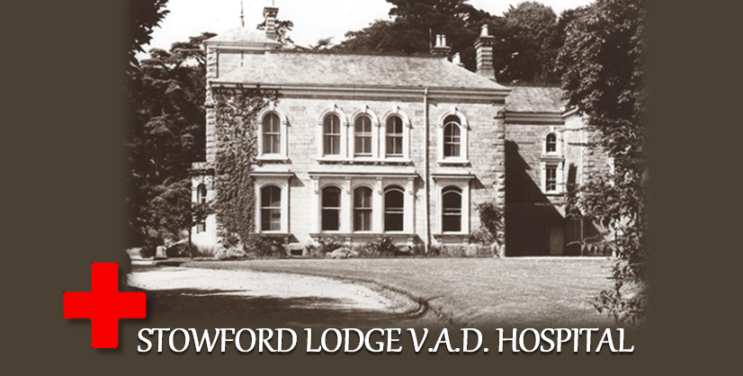 “We extend a very hearty welcome to the patients at Stowford Lodge and wish to assure them that we intend to do everything in our power to make their time here happy”, it was reported. Owing to the pressing need for accommodation, the hospital had to be opened several days earlier than had been originally intended. This involved a very special effort on the part of Mr W.B. Craig, Mrs Hawker (Commandant), and Miss Matthews (Quartermaster) and, as it was reported “assisted by a most energetic band of local workers”. The first batch of men arrived on Wednesday 19 Dec with Sister Stephenson in charge. The patients at V.A.D. hospitals were generally less seriously wounded than at general hospitals. The servicemen preferred these auxiliary hospitals to their military counterparts because they were less strict, not so crowded and generally more homely in nature. Patients in their ‘convalescent blues’, together with nurses outside Stowford Lodge, with the viaduct in the background. 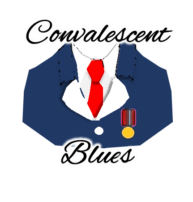 The standard uniform for WW1 convalescent soldiers was a blue jacket with white lapels. These were known as “hospital blues” or “convalescent blues” and made of flannel resembling ill-fitting pyjamas and were accompanied with a red tie. Military authorities required that the garment be worn at all times by soldiers. However, officers were exempt and were provided with a white armband bearing a red kings crown. Men who were unable to return to active service due to injury were issued with a Silver War Badge. This sterling silver lapel badge was intended to be worn on civilian clothes and signified that the person had completed their war service. In 1910, after a period of 60 years at the helm, the Allen family sold the paper mill to a syndicate. Prominent members were the Clapperton family who already owned a paper mill in Oxfordshire. For the next 14 years they invested heavily in the mill, despite a major fire, the outbreak of WWI and the difficult trading conditions which followed. Robert Henderson Clapperton became Mill Manager between the years 1910 – 1916 before his son, Richard Porteous Clapperton, took over and remained in charge until the mill was sold to Portals in 1924. He was Mill Manager when Stowford Lodge was given over to the Red Cross to become the V.A.D. Hospital and lived at Uplands on Exeter Road with his wife Mabel. Mabel Clapperton actively supported the VA Hospital from the outset, becoming the Assistant Quartermaster from December 1917 until October 1918. This was a very responsible role, helping to manage all the equipment and supplies of the hospital, such as the bedding, dressings and clothes as well as all the cleaning and laundry equipment. By February 1918, it was documented that there were 41 patients at the hospital. “The men seem pleased with their surroundings and are well looked after and catered for by the staff”. A billiard table was lent by Mrs Barbara MacAndrew of Lukesland which proved to be very popular with the patients, during the hours in which play was permitted! Matches were later held at the Constitutional Club giving the patients the opportunity to take on members of the local community. The parish magazine also stated that the men badly required the use of a field for football “they have a football, but for want of a ground cannot use it. The exercise would do a world of good to those permitted by the doctor to play. Will some landowner or farmer come to the rescue? Little if any damage would be done to the field”. Entertainment for the patients was further enhanced with the arrival of “an excellent second-hand upright grand piano”, bought for £32. Various concerts were enjoyed by patients and staff alike. Throughout the period of the hospital’s presence in Ivybridge, the generosity of the local community was unwavering. On 3 Jul 1918, a garden Fete was held inviting all the subscribers to the hospital. The proceedings opened with an “al fresco” concert by the patients, who, “as on previous occasions, delighted their audience with a high-class selection”. The Committee of patients also provided an excellent programme of sports, “carried out with zest, an accident to one patient in the three-legged race caused some concern; he has made a good recovery”. At the conclusion of the sports Mrs Mildmay presented the prizes, and expressed her thanks to all who had helped to establish and maintain the hospital, as well as to those who contributed to the success of the fete, special mention being made of the generosity of the owners of Stowford Lodge for placing the house and grounds at the disposal, rent free, of the British Red Cross Society; and to Mr Clapperton for the use of the lawn field for the sports. Mrs Mildmay was suitably thanked for her kind attendance and unflagging interest. In July 1918 orders were issued by the Southern Command that the Hospital would no longer be used for the reception of neurasthenic cases, the last left on August 3rd, “to the great regret of officers, staff, and patients”. Neurasthenic patients were men suffering from what is termed today as post-traumatic stress disorders but at the time ‘shell shock’, severe reaction to the intense warfare and enemy bombardment endured, with symptoms of fatigue, anxiety, headache, heart palpitations, high blood pressure, neuralgia and a generally depressed mood. Following a brief closure of the hospital, ‘general cases’ began to arrive from 9 Sept, when 35 patients were admitted from various sections of the 4th Southern General Hospital, Plymouth. The number of beds had been reduced from 50 to 45, in accordance with the wishes of the Surgeon-General Inspector of Hospitals. On 5 Oct 1918, “Our Day” was celebrated in Ivybridge where Red Cross flags were offered for sale with all the proceeds going to the Red Cross work overseas. 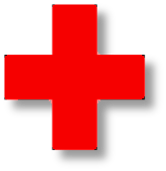 Our Day was a Red Cross fundraising event organised for the first time in 1915, which then took place annually throughout the war. The origin of the collection was considered to be “Queen Alexandra’s Day”, when people showed support for the Queen by buying flowers. During “Our Day”, street collectors sold flags, which were ordered and supplied centrally. Flags for motor vehicles were also available. Small flags were sold for a penny and silk ones were sold for six pence. On the morning of the 11th November 1918 the ringing of the large bell informed the people of Ivybridge that the Armistice with Germany had been signed. All the patients and staff paraded to the Parish Church to attend the Thanksgiving Service in the evening, and later an impromptu Concert was held in the hospital. To commemorate the occasion each patient received a souvenir cigarette case with a card, suitably inscribed ‘the gift of Subscribers to the Totnes Division V.A. Hospitals Fund’. Mrs E.W. Hawker, Assist. Commandant, presented the gifts and addressed the patients “ in a felicitous and telling manner on the duties and responsibilities awaiting each in the reconstruction of the nation’s affairs”. A real musical treat was provided on Christmas Day by the “Music in War Time Concert Party” under the direction of Mr F.W. Taylor, baritone of the Royal Choral Society; the party included Miss Florence Chambers, Contralto, Queen’s Hall Concerts; Miss Florence Hood, a celebrated Australian violinist; Miss Una Bourne, a famous Australian pianist; and Mr Harry Moreton, a humourist well-known to London concert-goers. The concert was greatly appreciated with “hearty applause and grateful thanks were accorded to the artistes, who are continually touring the country to entertain the sick and wounded in hospitals”. With the war at an end, the hospital finally closed in January 1919. From December 1917, Stowford Lodge, kindly lent by the owners of Stowford Paper Mill became a second line V. A. D. Hospital, providing 50 beds. The hospital was equipped and liberally supported by the residents of Ivybridge and the surrounding area. In many cases, women volunteered on a part time basis to help with clerical and kitchen duties, although the role of cook was a paid position. From the day it opened, the local parish magazine carried regular articles informing its congregation of life at the hospital which provides a unique insight of the work of the staff and the gratitude of the patients. “We extend a very hearty welcome to the patients at Stowford Lodge and wish to assure them that we intend to do everything in our power to make their time here happy”, it was reported. Owing to the pressing need for accommodation, the hospital had to be opened several days earlier than had been originally intended, involving a very special effort on the part of Mr W.B. Craig, Mrs Hawker (Commandant), and Miss Matthews (Quartermaster) and, as it was reported “assisted by a most energetic band of local workers”. The first batch of men arrived on Wednesday 19 Dec with Sister Stephenson in charge. The parish magazine recorded that by Christmas Day, “everything had shaken down into good working order, and a very happy day was spent; presents were given from the Devon County Fund for those in hospital, and also from the Red Cross, and the usual good fare was provided; after tea staff and workers and many friends were present, and a very jolly time was spent”. Throughout the period of the hospital’s presence in Ivybridge, the generosity of the local community was unwavering. On 3 Jul 1918, a garden Fete was held inviting all the subscribers to the hospital. The proceedings opened with an “al fresco” concert by the patients, who, “as on previous occasions, delighted their audience with a high-class selection”. The Committee of patients also provided an excellent programme of sports, “carried out with zest, an accident to one patient in the three-legged race caused some concern; he has made a good recovery”. At the conclusion of the sports Mrs Mildmay presented the prizes, and expressed her thanks to all who had helped to establish and maintain the hospital, as well as to those who contributed to the success of the fete, special mention being made of the generosity of the owners of Stowford Lodge for placing the house and grounds at the disposal, rent free, of the British Red Cross Society; and to Mr R.P. Clapperton for the use of the lawn field for the sports. Mrs Mildmay was suitably thanked for her kind attendance and unflagging interest. In July 1918 orders were issued by the Southern Command that the Hospital would no longer be used for the reception of neurasthenic cases, the last left on August 3rd, “to the great regret of officers, staff, and patients”. Neurasthenic patients were men suffering from what is termed today as post-traumatic stress disorders but at the time ‘shell shock’, severe reaction to the intense warfare and enemy bombardment endured, with symptoms of fatigue, anxiety, headache, heart palpitations, high blood pressure, neuralgia and a generally depressed mood. Following a brief closure of the hospital, ‘general cases’ began to arrive from 9 Sept, when 35 patients were admitted from various sections of the 4th Southern General Hospital, Plymouth. The number of beds has been reduced from 50 to 45, in accordance with the wishes of the Surgeon-General Inspector of Hospitals. A real musical treat was provided on Christmas Day by the “Music in War Time Concert Party” under the direction of Mr F.W. Taylor, baritone of the Royal Choral Society; the party included Miss Florence Chambers, Contralto, Queen’s Hall Concerts; Miss Florence Hood, the celebrated Australian violinist; Miss Una Bourne, the famous Australian pianist; and Mr Harry Moreton, a humourist well-known to London concert-goers. The concert was greatly appreciated with “hearty applause and grateful thanks were accorded to the artistes, who are continually touring the country to entertain the sick and wounded in hospitals”.